Wellington Cafes offer a very pleasant way to spend a few hours. Sip your latte by the harbour, or choose a cafe on Civic Square or Courtenay Place, and feel the hustle and bustle fade away in seconds. Cafes in Wellington offer so much more than coffee and cake. Wherever you're wandering, you'll come across friendly, personal service in one of the hundreds of pavement cafes in the CBD. The Waterfront has some delightful little places, serving ice cream, pastries, paninis and beverages. For a taste of Wellington's diversity, head to Cuba Street and nibble on a baklava while sampling one of dozens of different coffees you can get around here. 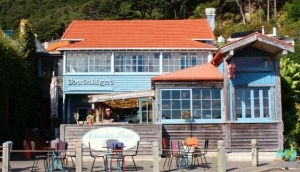 Don't forget, some of the best cafes are in Wellington's tourist attractions. Te Papa, and most of the theatres and art galleries, have beautiful little cafes and bistros, although you might pay more here than somewhere on the street. Oriental Bay has a lovely strip of cafes and bars, ideal for an afternoon coffee-hop.